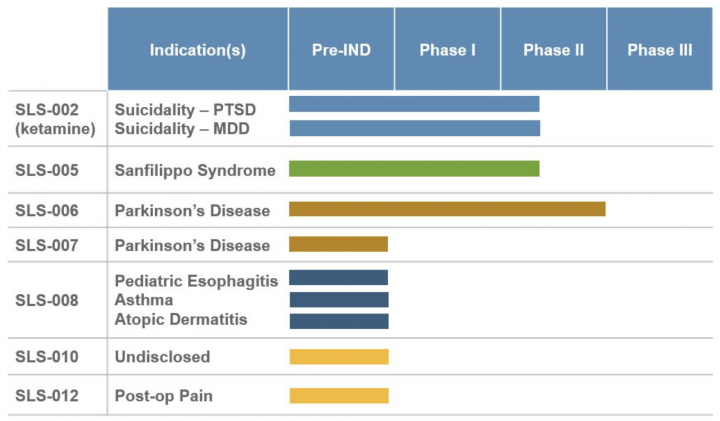 Two Months into a Reverse Merger, Where Does Seelos Therapeutics Stand Now? 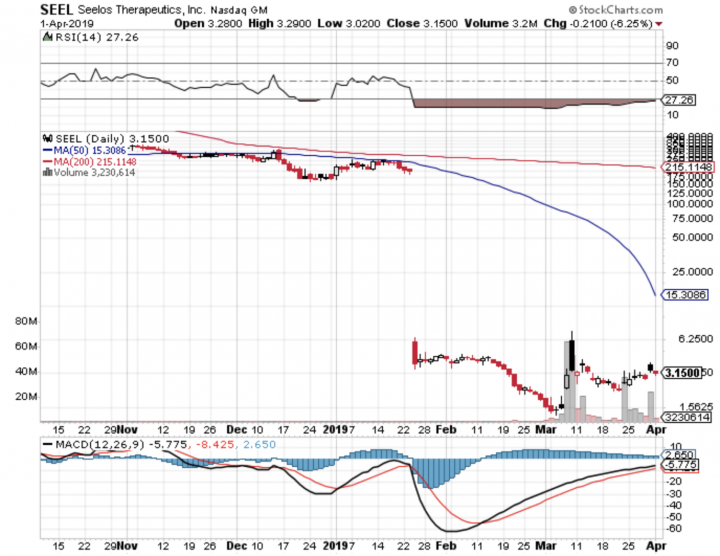 Seelos Therapeutics Inc. (NASDAQ: SEEL) is a clinical-stage biopharmaceutical company focused on the development and advancement of novel therapeutics to address unmet medical needs for the benefit of patients with central nervous system (CNS) disorders and other rare disorders. The Company’s robust portfolio includes several late-stage clinical assets targeting psychiatric and movement disorders, including orphan diseases. Seelos is based in New York. On March 28th, the company provided an update on recent pipeline developments and corporate highlights. The financials for FY 2018 primarily relate to the legacy company, Apricus BioSciences. 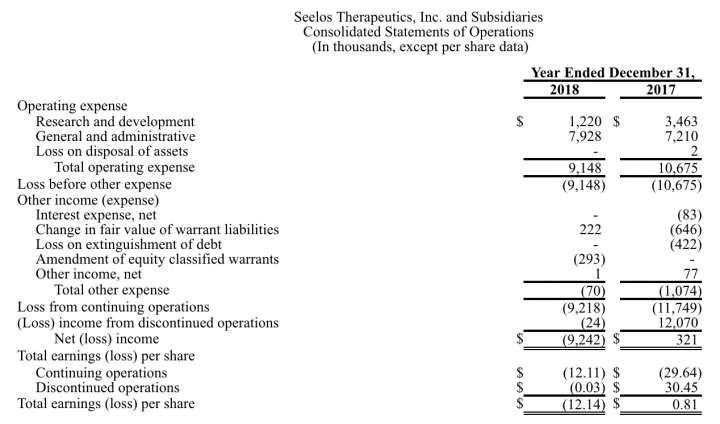 As of March 14, 2019, Seelos has approximately 18.4mm shares and 3.1mm warrants outstanding. On January 24th, Seelos Therapeutics completed its merger with Apricus and began trading under the symbol “SEEL” on the NASDAQ. Seelos completed a capital raise in conjunction with the merger. Cash, cash equivalents and short-term investments for the combined company at the closing were approximately $18 million, prior to payment of transaction costs. In February, Seelos acquired the worldwide development and commercial rights to Bioblast’s proprietary trehalose 90 mg/mL IV solution and all inventory of the drug. Seelos has named this program SLS-005. In addition, in February, Seelos assumed a collaborative agreement with Team Sanfilippo Foundation (TSF), as part of the acquisition as mentioned above. In March, Seelos acquired a license to technology developed at UCLA that relates to a family of rationally-designed peptide inhibitors that target the aggregation of alpha-synuclein (α-synuclein). Seelos has named this program SLS-007. The company’ share is trading with robust volumes as it announces pipeline advancement and successfully transitions into a publicly traded company on Nasdaq by completing its reverse merger with Apricus BioSciences, Inc. In line with its investigational new drug (IND) program, preparations are underway to initiate the phase I in the summer of 2019 to further evaluate the pharmacokinetics (PK), pharmacodynamics (PD), and drug-drug interactions (DDI) of SLS-002 in patients with post-traumatic stress disorder (PTSD) at imminent suicide risk (suicidality). Upon study completion and review of data, Seelos plans to request a post-Phase II meeting with the FDA to discuss trial design requirements for a pivotal study. TSF is finalizing the protocol for an up to 20 patient open-label phase IIb study in Sanfilippo syndrome that currently presents a few therapeutic options for patients. Seelos will provide the drug for the current 52-week study as well as an extension study and own all data upon the completion of the trial. Initial patient dosing is scheduled to begin in 2Q 2019. Seelos expects to begin to evaluate this peptide-based approach targeting the NACore (nonamyloid component core) in Parkinson’s disease (PD) in a proof of concept, in-vivo delivery of SLS-007 in a PD transgenic mice model in 2Q 2019. Liquidity and financial flexibility: The Company had an accumulated deficit of approximately $325.2 million as of December 31, 2018. As of December 31, 2018, the Company had a cash balance of approximately $3.6 million. The Company also reported negative cash flows from operations of $8.1 million for the year ended December 31, 2018. Successful completion of the upcoming catalysts would lead future direction for the company. Any adversities related to these upcoming milestones might adversely impact the overall investor sentiments. The company’ ability to obtain regulatory approvals. Moreover, the requirements and process governing the conduct of clinical trials, product licensing, pricing and reimbursement vary from country to country. SEEL is still an early stage entity and has not yet generated meaningful revenue and will likely operate at a loss as it grows its market position and seeks ways to monetize it. SEEL has a history of operating losses. Therefore, any time or cost overrun in its ongoing R&D activities and its impact on business & financial profile will remain a key business sensitivity factor. The present support and resistance levels for the stock are at $2.88 & $3.42 respectively.